What Are Piggybacking Tags and What Threats Do They Pose? Piggybacking tags are enough to keep the attuned marketer up at night. But what threat do they really pose? Learn more about piggybacking tags in this post. Learn how you can use ObservePoint's tag governance solution to verify you comply with data privacy regulations like GDPR. 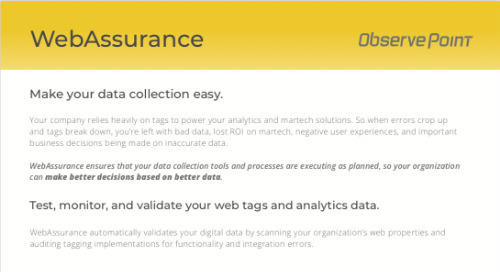 Learn how ObservePoint can scan your analytics and marketing implementation and help you identify rogue data collection. This article discusses the reasons why you should celebrate Data Privacy Day and data privacy in general, as well as ways to participate in the festivities. Still a little unsure about GDPR? Study an infographic covering some of the main terms and concepts to help you prepare for the upcoming regulation. This article discusses how companies should evaluate their mobile SDKS and third-party SDK vendors to ensure compliance with the upcoming GDPR regulation. Learn how to become an analytics hero by connecting clickstream, paid, social (Twitter, FB, YT) and CRM data with 0 costs. This article discusses the necessity of developing data governance practices to conform to new EU regulation surrounding data privacy. This article offers insights from GDPR experts on some of the top threats, opportunities and extra trends to watch out for.